Cruising log : May. – Dirty wet dog , boats and sailing. This month its all been about the west-country and the shakedown cruise out of Plymouth, along the coast taking in Fowey, Golant and Carlyon bay and then basing the boat at Mylor (Falmouth) for a while. 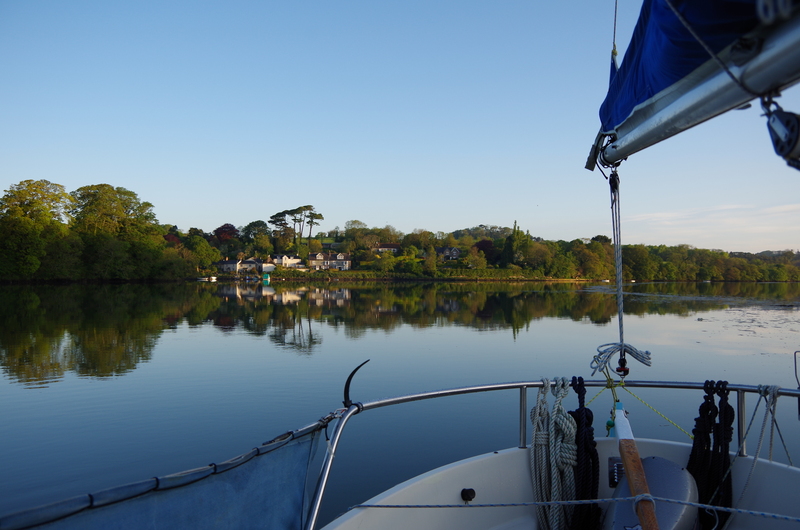 During May i have visited the Helford river, most of the tributary rivers and creeks above Falmouth and then had 2 days very brisk sailing back to Plymouth and ultimately back to base in the Tamar river. Right now WABI”’ is back on a mooring at Calstock boatyard, i have done the essential underside work and have the rudder blade at home in the workshop. Chris and Julia at the yard were tremendously helpful in letting me use the hoist and the slipway for a weekend. Once my back injury is sorted out i will be getting the rudder blade back on and hopefully making a move east with an initial plan of going into the Yealm , the rivers above Salcombe and the Dart. That should then take us up to our summer leave when we might (weather dependent) aim for Poole. WABI”’ Re launch at Calstock. Previous Back in the workshop. Taken at Porlock Weir. Caravan boats are certainly unexciting but, as you point out elsewhere, very useful and, I think, a source of pleasure for many. But give me a spartan existence crouching in an E-boat shitting in a bucket, with the partner nowhere to be seen, any day 😉 Horses for courses, each to their own and all that jazz eh. Hope the back is feeling better.